Chunky is such a fun word. Sure, “chunky” is not the word I want on my mind whilst wiggling into a freshly laundered pair of skinny jeans (it’s the heat from the dryer, trust me) or while coaxing together a smooth cream sauce. Some of life’s treasures, however, are at their most choice with a little extra chunk. Take babies for example. Or these adorable wedges to which I accidentally pledged my life while birthday shopping for my mom. The chunk makes each oh-so-adorable. Granola should be chunky. The crumb topping on coffee cake should be chunky. And for today, banana bran muffins should be SUPER CHUNKY. Super Chunk Banana Bran Muffins are choc-ful-o-goodies that you can both see and savor. No mashing of bananas here. Our favorite speckled yellow fruit has busted out of the batter and is showing off in chopped, tasty pieces. The result is a more intense banana flavor, pockets of sweetness, and super muffin softness. Honestly, the banana would probably have a total diva moment, except that we have a cast of super-chunk stars rocking out right beside it. Husky hunks of toasty walnuts and perfect plumps of juicy raisins join the bran-jam session, and it’s a muffin music fest for the ages. You may have noticed that “plumps” is not technically a word when used as I did in the previous sentence. I’m breaking language barriers here. We are breaking banana barriers by leaving the banana pieces whole vs. mashing them into the batter. It just feels (and tastes) right. Solidarity. Singing backup for our super chunky banana-walnut-raisin trio is a concerto of flavor. Bright orange zest sings soprano, deep molasses hums baritone, and the bran itself adds nutty harmony to Super Chunk Banana Bran Muffins. To keep things from getting dry (literally), we add buttermilk—a mega moisture-maker in baked goods—and creamy Greek yogurt. No boring, dry bran muffins here my friends. Especially after I worked so hard to convince you that bran doesn’t taste like cardboard. 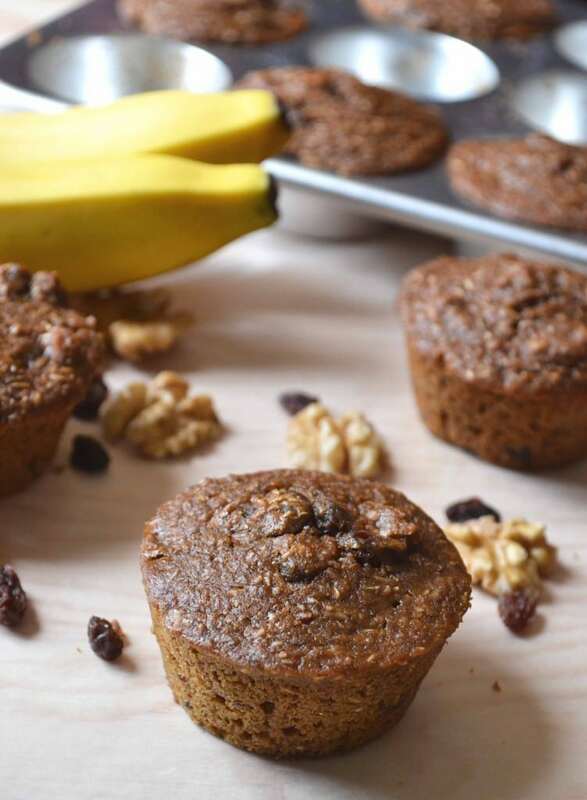 Super Chunk Banana Bran Muffins are a protein, fiber, and vitamin-packed breakfast or snack. Though I still adore my endlessly adaptable mother-of-a-bran-muffin batter, Super Chunk Banana Bran Muffins are a fun update that packs a bolder flavor, thanks to the boost of molasses and orange zest. With Super Chunk Banana Bran Muffins, you can love up the chunky and fit into your skinny jeans. You (and I) should probably reward ourselves with a new pair of chunky wedges to celebrate. Are you with me? Sweet chunks of banana, toasty walnuts, and plump raisins pack flavor and texture into these healthy bran muffins. Buttermilk, Greek yogurt, orange zest, and molasses add extra moisture and layers of flavor. Perfect for a tasty, satisfying breakfast or snack. In a small bowl, combine the bran and buttermilk and set aside. In the bowl of a standing mixer fitted with the paddle attachment or a large mixing bowl, cream the butter and sugar for about 3 minutes, until light and fluffy. Mix in the Greek yogurt and cream 2 additional minutes. With the mixer on low, add the eggs, one at a time. Add the molasses, orange zest, and vanilla. (The mixture will look curdled.) Add the bran/buttermilk mixture and combine. In a separate bowl, sift together the all purpose flour, whole wheat flour, baking powder, baking soda, and salt. With the mixer on low speed, slowly add the flour mixture to the batter, just until combined. With a rubber spatula, fold in the bananas, walnuts, and raisins. Fill the muffin cups to the top and bake for 25 to 30 minutes, until a toothpick comes out clean. *Ingredient Note: If you don't have buttermilk, simply combine 1 cup regular milk and 1 tablespoon white vinegar or lemon juice. Stir, set aside 5 minutes, then use as directed. Store muffins for up to four days, following my How to Store Muffins and Other Quick Breads or tightly wrap individually in two layers of plastic and freeze for up to two months. Mmmm! These muffins look great! These are the kind of muffins I like making, healthy and filling! We have similar muffin philosophies for sure. These babies will keep you powered all morning Jess! Erin, I loved this post! I think mashed bananas must be out because everyone’s slicing them. I haven’t tried them like this yet, but I can’t wait. Ooooo I didn’t know sliced bananas could be a ‘hot’ item, but I’m all for it! You should totally go for it Meg. Thanks for your comment! I love these chunky little muffins! Perfect for the whole coffee and muffin morning situation. You’ve got it Ashley! Thanks girlie. Yum! I love a good bran muffin! Chunky is exactly the right word to describe these muffins and my skinny jeans will thank me later when I am not saying a silent prayer for the zipper to close. You know it Nicole! Who knew something “chunky” could help the zipper close? ha! LOL Julie, best comment ever. You’ve got the whole idea here. Muffin=yes, muffin top=no. These look so insanely good!!! Ha! I think the word chunky is funny too! And I am all over these muffins!! have a great weekend!! Erin, these muffins look amazing! Love that you used wheat bran too… that means they’re super healthy right? ;) Thanks for sharing. Have a great weekend! Haha, chunky and plump. Never thought about it!!! Delicious looking muffins too! I love a nice banana muffin! P.S. your posts aren’t showing up on bloglovin? I thought it’d been a week +++ since your last post, so I finally came to investigate. I see that you’ve been posting up a storm, but they haven’t been coming through. THANK YOU so much for letting me know about this. It looks like several results for my blog show up in Blog Lovin when you search for it–I’ve contacted their support to fix this. Could you maybe be following the wrong “version”? Thanks again for letting me know! I so appreciate it. PS. Out of curiosity: Was blog lovin’ working for you with my blog previously? I’m pretty sure it was working before. The one I was following was the one with the most followers. I switched to a different one and hopefully that one works. Thanks Kelly! Blog Lovin’ also got back to me and said they deleted the duplicates. Hopefully you are good to go, and again–thanks for the heads up! For some reason I am not getting emails from you. I was having issues with my browser denying me access with Pinterest, though at first I thought it was something wrong with Pinterest. I had to do a forced shut down of my Kindle, after going round and round with Pinterest. I do not know if that is why I have not received any emails from you or not. Hi Janet—I double checked and you are subscribed to my email list. I would suggest checking your spam folder for the emails and also adding [email protected] to your address book. That way the emails won’t get blocked. I hope that helps!